I was only in Bangkok for 3 days, but have definitely learned plenty from my time here. It is an incredible city with so much to offer. I was surprised to see huge posh high-rises next to stained concrete buildings with rusty tin roofs, next to beautiful ornate temples and all of these surrounding fantastic markets. My first day was spent finding a guest house (private room with a bathroom for 300 B, about $10 per night) shopping on Khao San Road, getting my feet wet at the art of bartering and eating street Pad Thai for 30 B ($1). 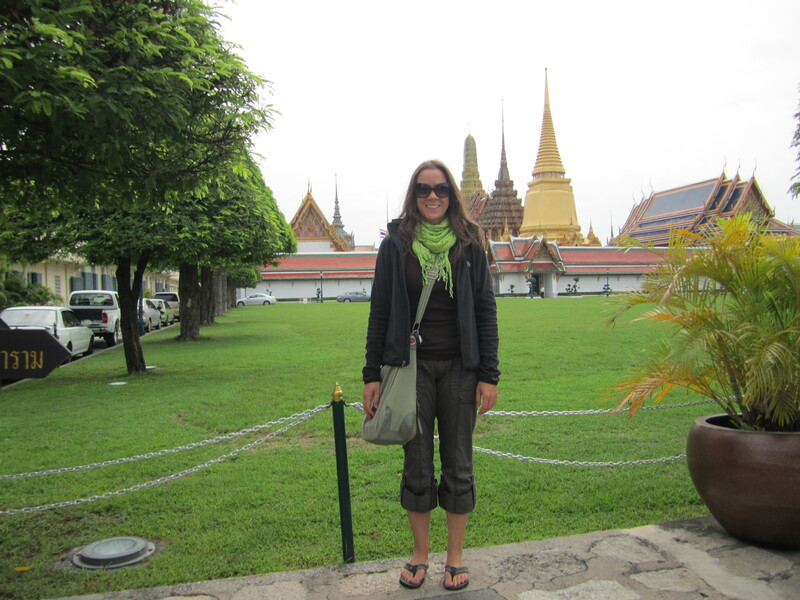 On my second day, I went for a walk down to the Grand Palace and Wat Pho. It looked very close by on my map, but walking in Bangkok is not as straight-forward as you might think. The Grand Palace was hopping with people so I decided to give it a skip (after a few pictures of course) and headed down to Wat Pho. I toured around the Wat and was blown away by the colours. Red and Gold roofs, flowers everywhere and not a huge crowd. I saw the giant gold reclining Buddha and hung out in the spires for a bit before getting ready to head to Chinatown. At this point one of the Wat workers told me about a deal the government had going for the day. I could get a government sponsored tuk-tuk around the city for 20 B to take me to specific Wats (temples). I knew there was likely a catch, but seeing as my plans for the day had not really been defined, I thought what the heck. I hopped in my Tuk-Tuk and we were off. We headed out to see the Lucky Buddha, then the driver asked me to go to an outlet so he could get free gas as his compensation for bringing me. This continued for most of the day. We went to one place I wanted to go, then one place he would get a gas certificate. I didn’t have to buy anything and it seemed to make my driver very happy so I was fine with continuing with this arrangement. We ended up spending about 5 hours together and it only cost me 20B (less then $1). I was able to see some fantastic things that I otherwise would have missed. He dropped me off in Chinatown at my request, and I roamed around there for a while. Chinatown is essential a massive network of alleys with everything under the sun for sale. After an hour or so of trying to get my bearings, I decided to walk back to my guest house (after making a few purchases of course). 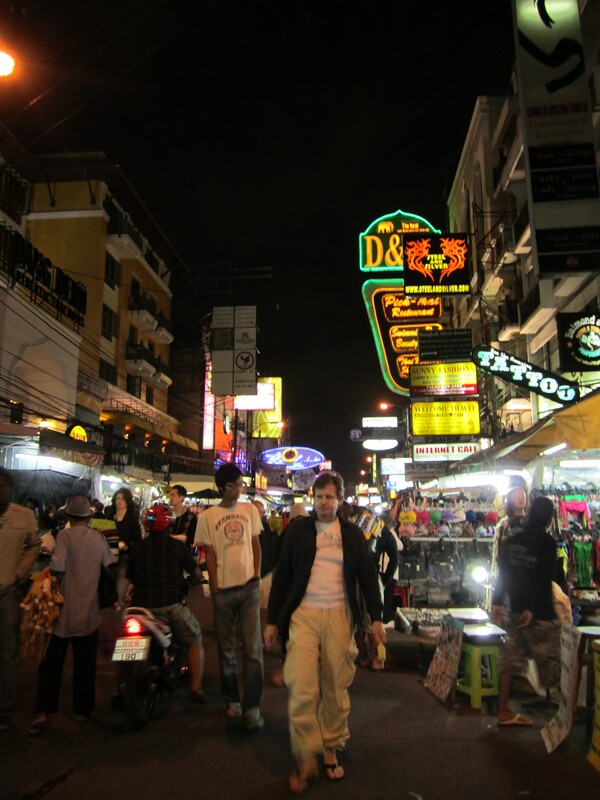 This experience has taught me a number of things about Bangkok. 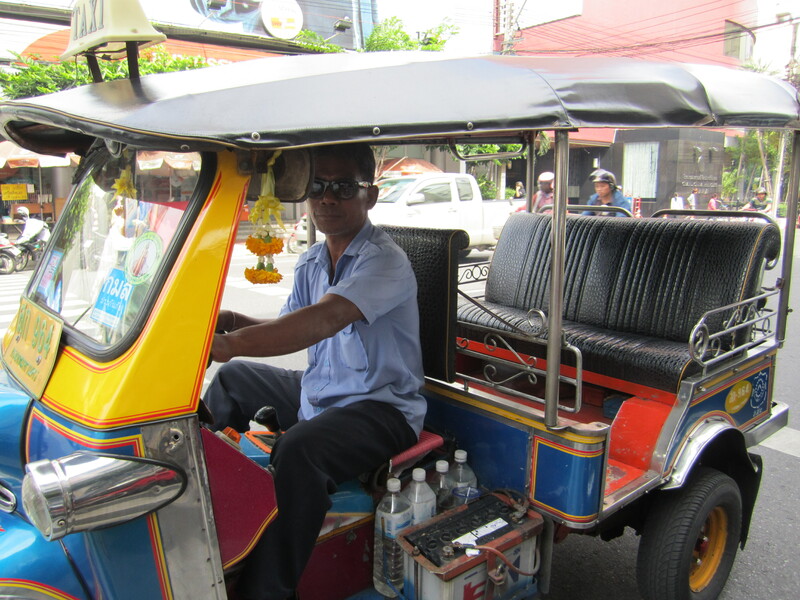 Although the Tuk-Tuk drivers have their own special agendas, they can work out quite well. Prepare to have a headache by about 3 or 4pm due to breathing air that you can see and taste. When walking, find a local to follow. 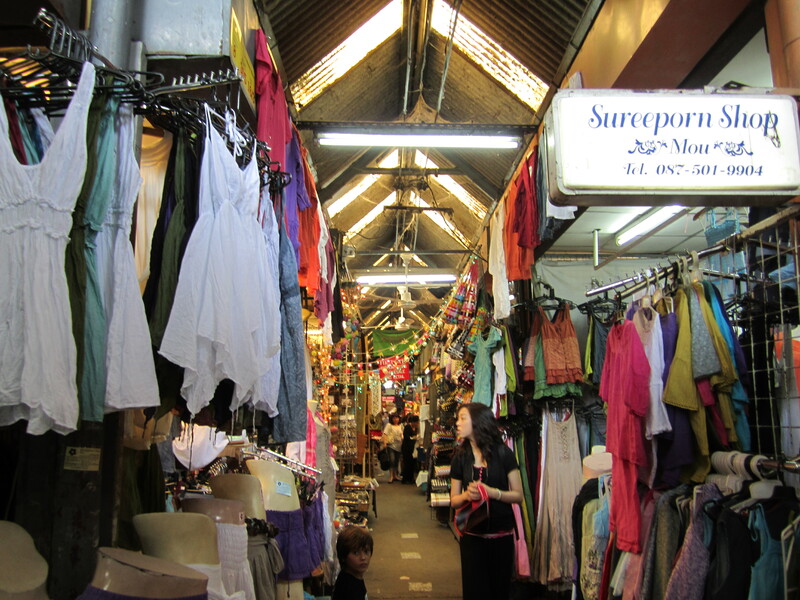 Always barter, especially when shopping on Khao San Road (they are used to getting way more than their items are worth). Be prepared to walk away from a purchase, you will always be able to find the same thing somewhere else. Shop around for the best prices. Chinatown has the best I found, but be prepared for some intense moments in very small alleys. You will get lost. There will be a time when you think you aren’t lost, but then you will get lost again. Be prepared to have to step out into oncoming traffic in order to cross a road. The cars will eventually stop, but not if you wait for them to. If you are unsure about crossing a crazy busy street, refer to #3. If you are unsure of the correct way to go, refer to #3. If you are lost (which you certainly will be), refer to #3. So, my main lesson here has been to follow a local. This also helped me out on my 3rd day when I wanted to go to the weekend Chatuchak market. I decided to take the public bus, which is an adventure unto itself. I was completely unprepared for the way bus stops work here. The bus approaches anywhere on the street and you flag it down, then as it slows, you run out into traffic (sometimes 3 busy lanes) and jump in. When you arrive, it is the same in reverse. I managed to get to the market thanks to a great Japanese couple who have been living in Bangkok. Once we were on the right bus (2 attempts) they told me that their town was in the Tsunami affected area, but thankfully their families are all ok. We got to the market and separated. I then spent the next 6 hours wandering, bartering, getting lost and found, and doing some amazing people watching. When it came time to leave, I tried to make sense of the buses on my own. Big mistake. After getting on what I thought was the right bus, the money collector let me know that I was way off, stopped the bus and let me out. The same thing happened again on my second attempt. After 2 tries, I thought I should refer to #3. I followed a group from Sweden who were following a local. This time I made it to the right location, then as the bus slowly drove past, the money collector leaned out the door and yelled “Khao San?” at me. I must have looked lost, but thankfully made it back to my guest house 1 ½ hours after deciding to leave the market. I have to admit that when I left Brisbane, I was a little nervous about beginning the solo portion of my trip. However, Bangkok has been good to me and I am starting to grasp the idea that I am totally fine on my own. I have seen some incredible things, met some really nice people and eaten some amazing food. I have only been here 3 days, but have a much higher respect for Bangkok then I expected. It is unlike anywhere I have been before and that is exactly what I needed. Hey Kerri – between that post and your FB message I got a lot of smiles. Sounds like a great stop. At this rate are there any part of the globe that you will not set foot on over the next year?? Wow! Sounds like an interesting place. Certainly like the prices for things! Have fun, stay safe. And don’t forget to follow a local! wow, such adventures. i dont know what i like better – 5 hours in a tuk tuk for a buck (what a bargain) or a day pass on a ferry through town. sounds like you’re having a great time. love your stories and your beautiful pictures. First solo adventure sounds like an adventure for sure – so incredible – and brave! If anyone can do it, it’s you 🙂 Can’t stop smiling for you, lots of love, keep lovin’ life! sounds absolutely incredible!!!! And I can only imagine how important it is to follow a local – especially crossing the roads – Nate and I call them ‘blockers’!